We are celebrating summer by offering our LIFETIME REGISTRATION **FREE** with any new membership for as many horses as you register ($50.00 value for each horse!). Our “Lifeline for a Lifetime” assures your horse a registry in our national database for the duration of its life. The certificate is transferable to new owners, should you sell or re-home your horse at any time. The original purchasing member’s contact information remains linked to that horse for life (members are responsible for keeping information current through the years. New owners may be listed with a lifetime registered horse. Complete owner history and contact information is archived and retained for each horse.). Your lifeline horse may be tracked back to you at any time through its life as a person of interest in this horse’s well-being. For a limited time, new members receive their Lifetime Certificate in their membership packets for each horse registered (photos and details must be completed in each horse’s profile within our database to generate the certificate). Certificates are printed on beautiful parchment paper suitable for framing and will make a valuable addition to your horse’s documents. Each horse registered for a lifetime will remain in the EQR national database regardless if the original member maintains their annual dues, and regardless of how many times the registered horse changes ownership. 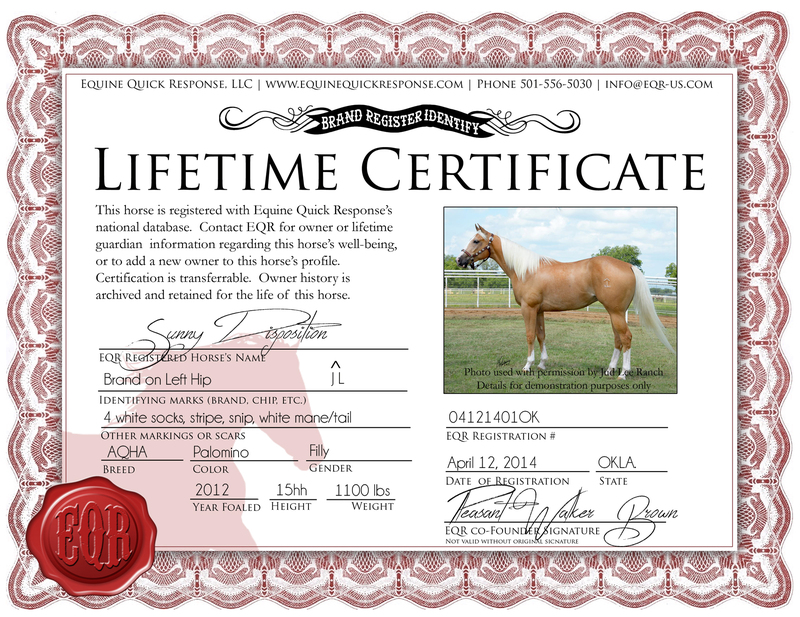 This LIFETIME CERTIFICATE is so important to us as a value to horses, adding security to their livelihood and a lifeline to be returned to a caring home, that any current member wishing to receive a Lifetime Certificate for their presently registered horses may request to have certificates generated for their registered horses at a nominal fee to cover the cost of shipping and printing. Don’t delay, the weather could change at any time and this offer will end! 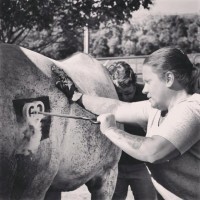 Once your horse’s profiles are complete, your certificates will be generated from the information you provide. Your certificate(s), one per horse registered, will be printed and shipped to you with your new membership packet. Question: What’s the difference between a regular membership and a lifetime membership? Answer: Regular memberships must be maintained by annual dues. If a member has purchased a lifetime membership for a particular horse (or received one free with this offer), their horse’s profile and owner history will remain in our database regardless if the owner maintains their membership. While the member may miss out on many member benefits, including the ability to add new horses, the lifeline horse will continue to be able to be tracked back to the original owner for its lifetime. Lifetime Registration can only apply to the particular horse it was assigned to, though it is transferable to new owners. 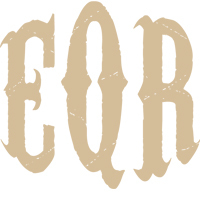 Archived owners who are no longer members will not have a personal EQR member profile with their registered horses listed under them. Only the lifeline horse will have a database entry, with owner contact information archived. Lifetime Registration is only available for purchase by current members and their registered horses as a premium level of service. Annual memberships pertain only to owners, with their registered horses listed under them in the database. Members may also register trailers, store pertinent documents within each of their registered horse’s profiles, upload current photos at any time, access documents from any web enabled device, and receive discounts from our growing list of discount merchants, as well as other benefits. Each member’s profile may serve as a ‘bank’ of important, crucial information, stored neatly according to the horse the information pertains to, easily accessed in the event of emergency, theft or disaster.